The curry paste would be made from cumin seed, coriander seed (not leaf or root), red chilli, garlic, fresh ginger, turmeric, cinnamon, sesame oil and coconut milk. 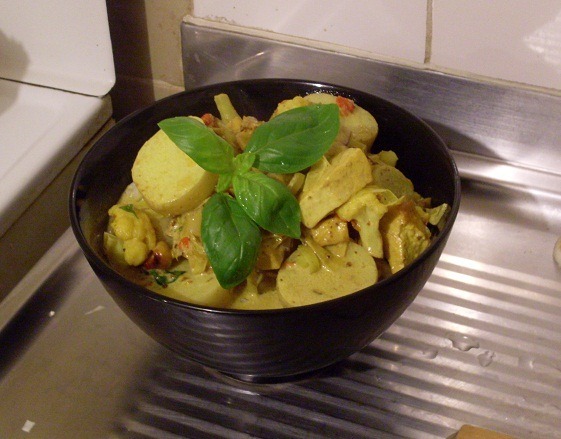 The choice of vegetables would consist of cauliflower (which I think goes well with yellow and red curries), small white potatoes, leek, shallots and basil, while the ‘substitute’ for meat would be firm tofu and cashews. Onions were off the menu (in lieu of the leeks and shallots), given that they may have overpowered some of the more delicate flavours. 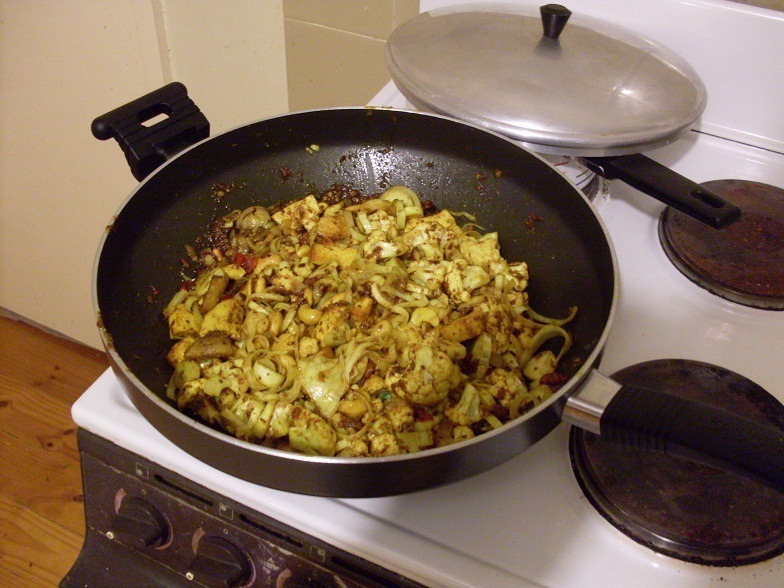 Ditto for now, for fenugreek and bay leaves in the curry paste, which were considered, but mooted on account of my brother’s tastes. The chilli was kept at a moderate quantity. If you’re one of those annoying ethical foodies like me, in addition to the issue of animal products, you may wish to consider the treatment of your fellow humans when selecting nuts, or nut products – buying Australian grown nuts will prevent you from purchasing what could be produced with what is tantamount to, if not actual, slave labour. (Obviously, you may want to take different measures, depending on where you are in the world). The first step was to plonk about 12 small, halved potatoes into boiling water, to cook for ten minutes, while bashing the bejesus out of the coriander and cumin seeds (this latter step released a rather strong aroma into the kitchen, which was more than a little pleasant). Some people toast their coriander seeds before whacking them around in the mortar and pestle, but I opted out of that, not wanting to risk burning them to produce any acrid flavours. I used 2 tablespoons each, of both the coriander and the cumin. Next I added half of a quill of cinnamon and gave it a bit of a bash around. I think I’ll use ground cinnamon in future, as later on in the night, I had a thick splinter of the stuff manage to wedge in and hit a sensitive spot on one of my teeth. It seems that cinnamon quills may be just a little too hard for the job. You can have that happening when you’re cooking for guests, if experimenting. Luckily nobody else was hurt, and nothing was damaged on my end, other than a little pride. It’s probably a good thing this isn’t my job. When the seeds and cinnamon were bashed down into a powder, in went four cloves of garlic, and about twice as much peeled, fresh ginger. 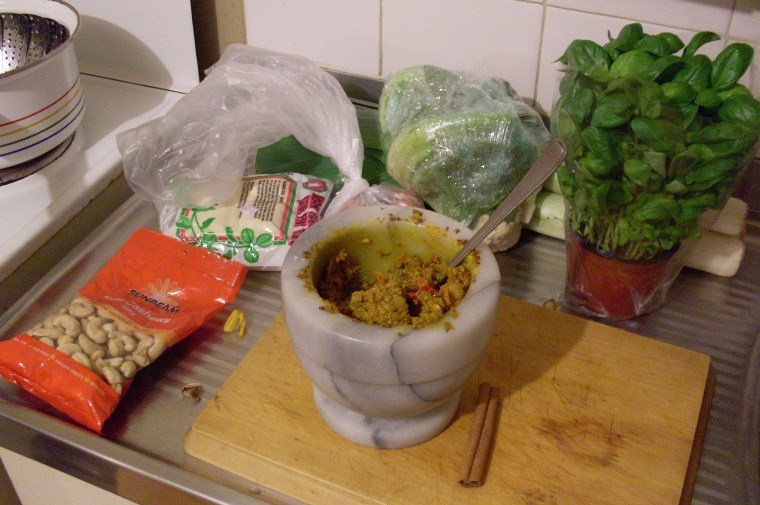 This in turn was pounded down into a moist paste, before two mild red chillies were cut down to size and ground into the mix, to be moistened up a little further with a tablespoon of sesame oil. By this point, the potatoes should be boiled and back in the fridge, and it’s time to get the rice cooking if that’s what you’re having with your curry (you could try this with noodles). I usually use Doongara rice, which is a fast cooking Australian long grain rice (that’s a little on the plump side for a long grain, even for a shorter long grain – the Arborio of long grains, maybe), but this time I went with jasmine rice. I’ve been tinkering around with a method to get nice fluffy rice, not being good with a fully-fledged steamer, and not being able to achieve what I want with the conventional European way of simply boiling rice. My current tactic, which worked out pretty well, is a bit of half-and-half; I boil the rice for only 5 minutes, before straining the water off, dropping the partially-cooked rice into a vegetable-steamer with 1cm of water, and steaming away, with the lid on for another 7 minutes. That’s the vegetable steamer, in the dodgy old pot on the right. You can dial down the heat when it’s done, and leave the lid on, and the rice stays nice and fluffy and hot, ready to be served when you’re ready to dish it up (within reason, of course). I’ll be sticking with jasmine rice as well, for the foreseeable future. After that, it’s time for the tofu and the cashews, which need a little more heat up front than the following ingredients, to sear, seal, brown and the like. When it reaches the point where the cauliflower hasn’t quite lost all of its crunch, it’s time to add the coconut milk, the potatoes and the fresh basil, and return the mix to a steady heat. Watching the curry infuse into the coconut milk was a nice sight, almost like mixing paint on a palette (the smell was considerably better). 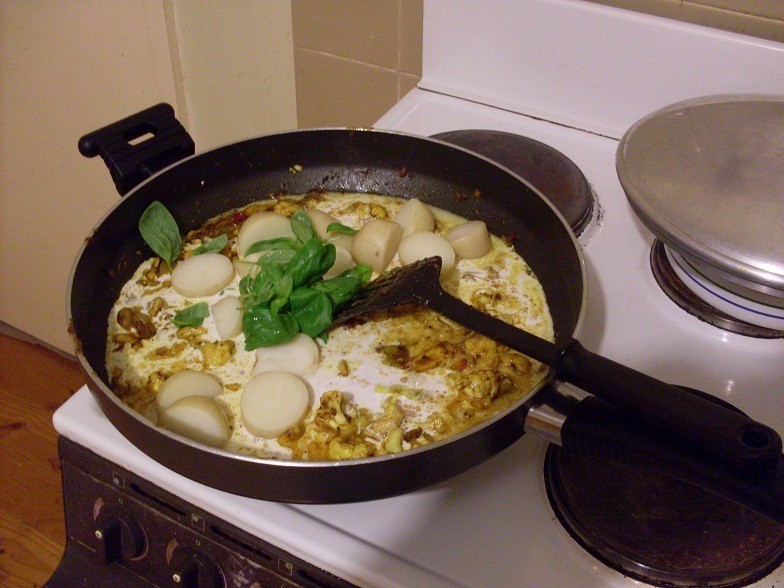 The point at which the basil goes soggy, is the point where you know without a doubt you’ve cooked it for too long. If your rice, on the other hand, which has been steaming away in the background, isn’t cooked, you know you’ve still got more time to spend frying the curry in your wok. Somewhere between these two waypoints is a point where you’ve just got to use your own skill and judgement. It looked edible, at least. So what was the verdict with the meat-eating brother? He loved the vegetables, the only bit he didn’t really care for (it was still ‘okay’) being the tofu. Remember how I was advised to just go with vegetables, and forget a meat substitute? This piece of advice attained omnivorous ascent. I have to say, that while I’ve steered away from using tofu, on account of past failures, I didn’t mind it on this occasion. In fact, it was the cashews that didn’t win me over on account of being a little rubbery. And there was something else that I seemed to pick up on – the taste of coconut was just a little too strong for my liking. So what’s the plan for next time? Next time, I’ll be considering other veggies, while omitting the tofu. The cashews will possibly be replaced with peanuts. 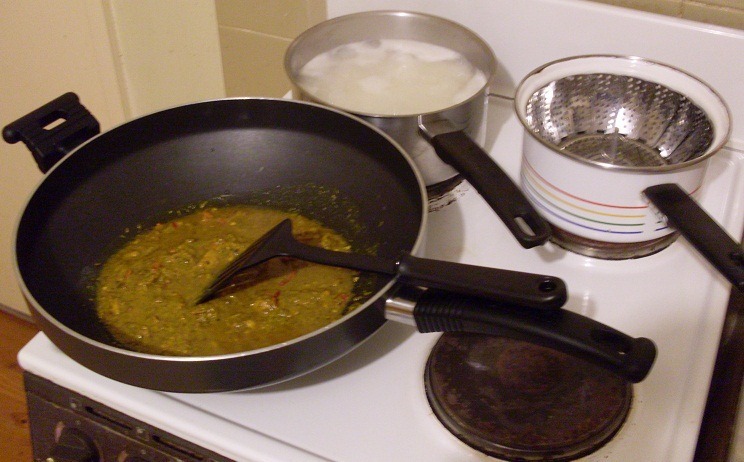 The night before cooking the meal, I plan to pre-prepare the curry sauce. 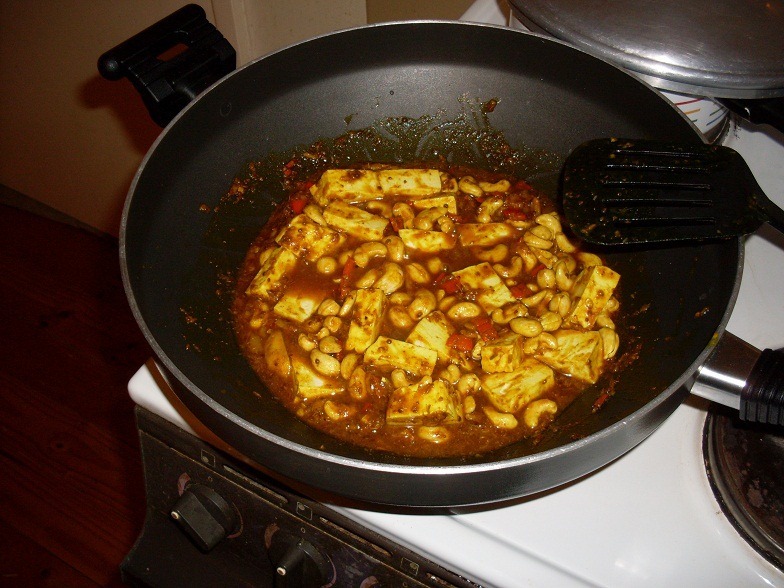 This will entail the usual process of frying the curry paste, but with the addition of the coconut milk immediately afterward, with the whole sauce to be refrigerated over night. 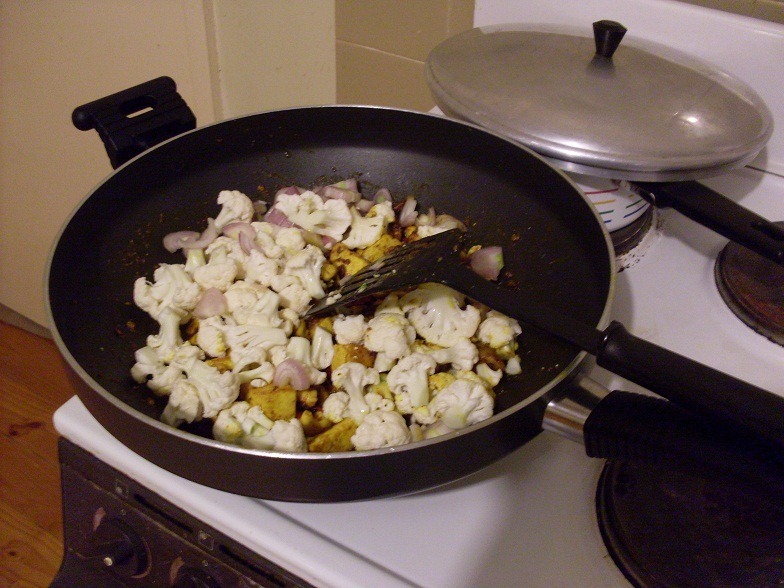 The nuts will be pan toasted the night beforehand as well, and left in the fridge, in the curry sauce. 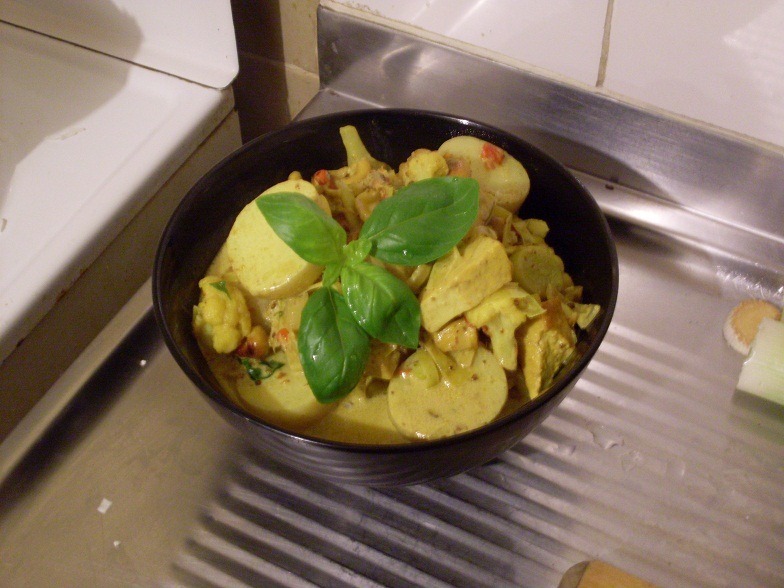 I’ll also be reviewing exactly what spices to add to the curry sauce next time around as well. The rationale for these changes is to allow the curry paste to cut through some of the coconut flavour overnight, while the nuts loose their rubbery consistency. This may or may not work. I hope to take photos, and report greater success, next time. Next Next post: …assuming the mantle.